Objective: Classic laparoscopic surgery is based on the ability to triangulate instrumentation to have good exposure and working space. This is done with multiple trans-abdominal ports. Decreasing the number of ports may be beneficial in decreasing pain. In addition elimination of port sites eliminates the risk of herniation at those sites and provides a definite cosmetic benefit. The visualization platform is evolving as our clinical experience broadens. A challenge of visualization with a rigid laparoscope in a single incision operation is collisions between the instrumentation, the camera head and the light cord. This makes triangulation and steady visualization difficult. To eliminate these collisions and stabilize the visualization platform we have adoped the use of a sterile high definition endoscope as our imaging modality of choice. 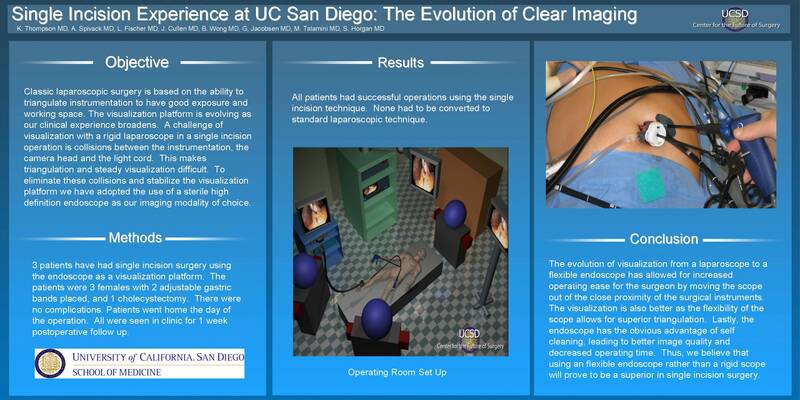 Methods: 3 patients have had single incision surgery using the endoscope as a visualization platform. The patients were 3 females with 2 adjustable gastric bands placed, and 1 cholecystectomy. There were no complications. Patients went home the day of the operation. All were seen in clinic for 1 week postoperative follow up. Results: All patients had successful operations using the single incision technique. None had to be converted to standard laparoscopic technique. Use of the flexible endoscope in place of a rigid endoscope allowed for better visualization, movement of instruments in the ports and ease of surgery. Conclusions: Decreasing the amount of incisions decreases patient pain, risk of port site herniation and gives improved cosmesis. The evolution of visualization from a laparoscope to a flexible endoscope has allowed for increased operating ease for the surgeon by moving the scope out of the close proximity of the surgical instruments. The visualization is also better as the flexibility of the scope allows for superior triangulation. Lastly, the endoscope has the obvious advantage of self cleaning, leading to better image quality and decreased operating time. Thus, we believe that using an flexible endoscope rather than a rigid scope will prove to be a superior in single incision surgery.